Askbot is an open source, simple yet powerful, fast and highly-customizable software for creating a question and answer (Q&A) forum. It is inspired by StackOverflow and YahooAnswers, and written in Python on top of the Django web framework. It allows for efficient question and answer knowledge management, thus organizations such as Fedora’s Q&A forums and LibreOffice’s Q&A Forums are making good use of it. Askbot can work as a standalone application or can be integrated with your existing Django apps or other web platforms. In this tutorial you will learn how to install AskBot on CentOS 7. In order to complete the tutorial, you will need to have a CentOS 7 server minimal installation with root access. We will start by installing the required dependencies such as development tools by using the following command in a terminal. After that we will install Epel repository, if it hasn’t already been installed on your system. Lastly, we will install some of the python dependencies required to later run AskBot. In case python-pip is not installed with the above command, you can install it with by using the following command. AskBot requires a database where it will store its data. It uses PostgreSQL, so we will need to install it and configure it on our system. You can use the following command to complete the installation. When the installation is complete, initialize PostgreSQL with. Now that our database server is up and running, we will login as postgres user to create a database for our AskBot installation. Now we are ready to install AskBot via pip. The installation may take a couple of minutes. Once it is complete, we can test our installation in a temporary directory. Make sure NOT to name that directory askbot. You will be asked a few question where you will have to select the installation directory – use “.” (without quotes) to choose the current directory. Next you will need to enter the earlier prepared database name, database user and its password. When you go to your browser to http://127.0.0.1:8080 – you should see the askbot interface. That’s all! 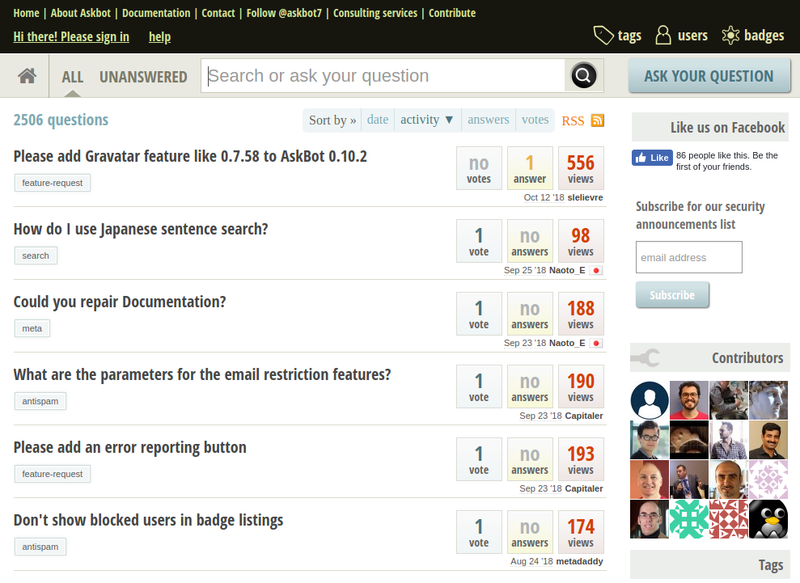 Askbot is an open source, simple, fast and highly-customizable question and answer (Q&A) forum software. It supports efficient question and answer knowledge management. If you encountered any errors during the installation or have any other related queries, use the feedback form below to reach us.